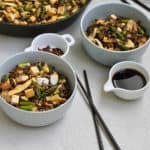 Springtime Fried Wild Rice - A vegetarian fried rice dish made with wild rice, asparagus and tofu, that comes together quickly and is packed with nutritious ingredients. Start by chopping everything that needs chopping and organizing it on your kitchen counter. So trim the asparagus and chop into bite-sized pieces, chop the green onions, and dice the tofu. Get all of the ingredients lined up in the order you'll be using them in. Now make the sauce so it's ready when you need it! Whisk together the soy sauce, honey, ginger, vinegar, and red pepper flakes in a small bowl. Set aside. Heat a large skillet over medium-high heat. Add 1 Tablespoon of olive oil to the pan, and swirl to coat the bottom. Crack the eggs into a bowl and whisk until pale yellow and slightly foamy. Pour the eggs into the hot skillet and swirl around in the pan to distribute evenly. Wait a minute or two without disturbing the eggs, so the bottom begins to set. When the eggs are firming up, using a spatula fold one-third of the egg over towards the center, and then roll this over the remaining exposed third, so you've got a three-layer omelet. Slide the omelet out of the pan and onto a waiting plate. Return the same pan to the heat and add a tiny bit more oil if needed. Add the tofu cubes, and let them cook for a few minutes on each side, until nicely browned. This should take about 10. Slide the tofu out of the pan and onto a waiting plate. Return the same pan to the heat, and add the asparagus. Cook for 2-3 minutes until bright green. Add the frozen shelled edamame and the green onions. And cook, stirring frequently, for 2-3 minutes. Add the cooked wild rice and stir to thoroughly combine with the vegetables. Cook for 2-3 minutes, stirring constantly, until rice is hot. Quickly slice the omelet into thin ribbons, and add it to the fried wild rice, along with the cubed tofu. Stir to combine well. Add half of the sauce, stir to combine, and taste. Add remaining sauce if desired. Serve fried wild rice immediately, with extra hot pepper flakes sprinkled over top if desired.